(Story and photo courtesy of Perry Bergson, The Brandon Sun) — Jake Chiasson can’t wait to skate for the Brandon Wheat Kings. A product of Abbotsford, B.C., Chiasson was selected with the 15th overall pick during the Western Hockey League draft in Red Deer, Alta., on Thursday morning. The six-foot-one, 162-pound forward scored 20 goals and added 48 assists on the Yale prep school’s bantam team playing right wing after growing up in the game at centre. He was at home watching the live stream with his family in the living room when he learned the news. The right-handed shot plans to return to Yale, which is in his hometown of Abbotsford, to play on the midget prep team next season. The Wheat Kings selected nine other 2003-born players on Thursday, including a trio of second-rounders, forwards Brett Hyland of Edmonton and Dylan James of Calgary as well as defenceman Jacob Hoffrogge of Saskatoon. 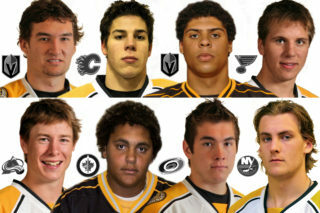 The Wheat Kings selected one player each from B.C. and North Dakota, three each from Manitoba and Alberta, and two from Saskatchewan. 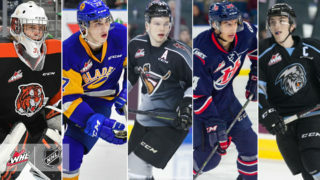 General manager Grant Armstrong was pleased with the team’s haul, which ended in the eighth round after the team traded its two 10th rounders to the Portland Winterhawks for a ninth-round pick in 2019. Brandon didn’t have a ninth-round pick. Brandon didn’t draft a goalie for the second year in a row, with 2001-born Ethan Kruger set to potentially join the team next season and 2002-born list player Connor Ungar waiting in the wings. 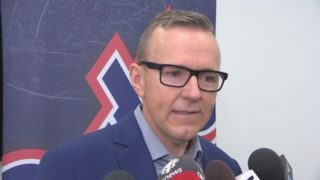 Armstrong chuckled that he was looking to move up in the first round, but would have been looking to pick Chiasson anyway so it was fortunate it didn’t happen. In fact, no teams moved up in the first round this year on draft day. He said there are always surprises at the draft, but most of them fell on the happy side for the Wheat Kings this year. James was thrilled to be picked. He stayed home from school in the morning to find out where he was going, and was happy with his destination. The left-handed shooting left-winger hopes to land a spot with the Calgary Buffaloes midget program next season. James said he sees the ice well, skates well, passes well and is a good leader but said he is working to improve his stick handling and shot release. He has no doubt where he wants to play. It’s a similar story for Hoffrogge. 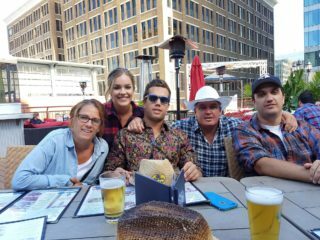 The Florida-born youngster, who was adopted into his Saskatoon home, went to school and found out he had been picked during gym class. “A lot of people thought I was going to go the NCAA route because I’m American-born but I always wanted to play in the WHL,” Hoffrogge said. Hoffrogge said he skates and passes well and has a strong hockey IQ, and wants to get stronger and shoot better. He is looking to land a spot with the Saskatoon Contacts AAA midget team. The right-handed defenceman, who usually plays right defence, is excited about the future. While Chiasson chuckles about his concerns about Manitoba’s winters, he said he considers the Wheat Kings one of the top producers in the Canadian Hockey League of NHL prospects. He said he’s continuing to improve his body checking, because with his size he can separate players from the puck, and he said he’s always working on his foot speed. Brandon’s first-rounder knows what he can bring to the table, and hopes he can display it in Brandon. Brandon Wheat Kings director of scouting Darren Ritchie discusses what he likes about each of the 10 players the team drafted on Thursday. F, 6-1, 160 pounds, Abbotsford, B.C. F, 5-11, 167 pounds, St. Albert, Alta.